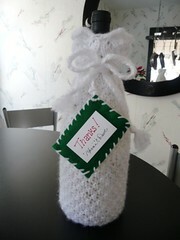 I've already posted the wine bottle gift bag but it didn't fit a standard 750ml bottle so I went and picked up a large wine bottle which fits great! 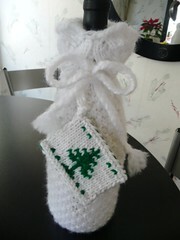 But I decided that it needed a gift tag so using the tree chart pattern for the knitted socks I made this little tag. At first I used spray adhesive to attach a card the same size size of the knitted tag but it looked stupid so I peeled it off. So I cut a piece of felt to size and whip stitched it together. The end result is much nicer and neater looking too.